Ferries (catamarans) are operated by a couple of companies from Gateway of India (Bhau-cha Dhakka) Mumbai to Mandwa jetty near Alibag. 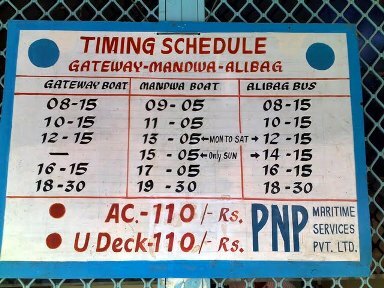 The fare is usually inclusive of the bus ride from Mandwa to Alibag city-centre/bus stand. This is perhaps the fastest way to reach Alibag, and then Murud – especially if you are in South Mumbai. Got a picture of PNP’s schedule – thought it could be of use! Last week when I had been to Nandgaon for Maghi Ganesh Utsav, my advocate brother had to reach court around 11am. There was no way he could make it by road (+ train) since we left around 7am from there. So we dropped him off at Alibag at about 8am and he was at Churchgate at 10am. I had once taken this option when traveling to Murud with my grandpa.